I would like to thank particularly David Duxbury, but also everybody who has contributed information on the individuals listed below. The Zinzan crew arrived at Mepal on 3rd December 1944 from 1665 Conversion Unit. On the 11th of the month Vernon undertook a ‘second dickie’ flight with the Wakelin crew to Osterfeld. The following night the crew undertook their first operational raid to Witten – it was not without event. Over the target, it would appear they collided with the aircraft of F/Lt Hannan (also of 75(NZ). It is believed that the damage sustained in this collision forced Vernon to land heavily on their return to base. The resulting impact caused the Air Bomber, Ken Mesure to break his leg. This incident seems to have started a chain of replacement aircrew that resulted in Bob joining the crew on his return to the squadron, after the crew had completed 9 ops up to the end of January 1945. Based on my research of other crews, this crew seems to have gone through an amazing number of initially Air Bombers and latterly Rear Gunners – I currently have no explanation for this. Vernon was born 18th May 1912. He enlisted in the RNZAF 30th May 1942 and was transferred to reserve 25th September 1942. Vernon was one of the older pilots in the Squadron – I think its quite ironic that when Bob joined the crew as a 1st tour veteran, he was 10 years Vernon’s junior! With 75(NZ) from 20th Oct 1944 to ?Apr 1945. Initially crewed with Wylie James Wakelin as MU/Gnr then to crew of David St.Clair Clement as R/Gnr. 22 Jan to x May 1945. Trained as mid-under-guner but c/w John Mathers Bailey as R/Gnr. He is noted as being posted to the Squadron with another A/G from Feltwell on the 22nd of January. 21 Dec 1944 to x Jun 1945. c/w R B Crawford as R/Gnr. 16 Jan to x May 1945 as Mid-Under Gunner. 21 Dec 1944 to (inj) 3 Feb 1945. c/w Roderick Bruce Crawford. On the 3rd February, Sgt Bullock was one of 5 crew who were injured on landing after a raid to Dortmund. Sgt. Bullocks single Op with the Zinzan crew was actually before this date and one must assume therefore was fill in for the then rotating A/B position in the Zinzan crew prior to Bob’s arrival in February 1945. His single Op with the Zinzan crew was 13/1/45 Saarbrucken. 9 Mar 1944 to 5 Feb 1945. c/w D M Stevenson. Bert Winn flew his first tour with 576 Sqdn as rear gunner with Ken Murray’s crew. That would be Jan 44 to June 44. I met him and he told me he later flew with 75 NZ Sqdn. He was a Yorkshireman and lived most of his life in Saltaire. He died about 10 years ago. Went to his funeral. Many thanks indeed for getting in touch about Herbert – and adding that extra information about him.I suspected he was probably 2nd Tour when he arrived at Mepal – he came as a Mid Under Gunner – some of the Lancasters were fitted with ventral (underbelly) gun turrets – though not a particularly successful experiment by all accounts – So his duties included standard gunner positions as well, which I suppose is why he ended up twice in the rear gunnery position of my fathers aircraft. I wonder, do you know of any surviving relatives ?? 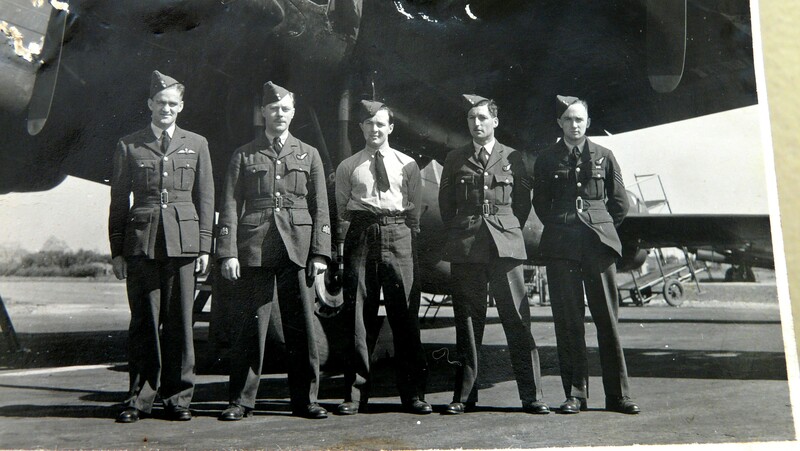 My grandfather flew in 576 Sqdn with Ken Murray’s crew. Do you know what happened to Ken Murray? I seem to remember being told he moved to Australia after the war? Ken Murray emigrated to Australia and became a test pilot for De Havilland. Bert Winn had 2 children I believe but I have not seen either since Bert’s funeral. Bert was a sound chap and a good air gunner. Steady, reliable and knew his job. His 576 Sqn crew spoke very highly of him. Hi. H Hutchinson returned to farming but sadly died in April 2004 . He never spoke of what they did but had very fond memories of who he flew with . I would really love to learn more as I was and am very proud of my dad. Judy. Hello Judy – how wonderful to hear from you – I have held out all these years since I started the blog, hoping to hear from a relative of one of Dad’s crews – please was was your Dads first name?? Hello. My dad was called Harold Noel Hutchinson. I think he was nick named Tim by his crew pals. I’m so pleased you responded to my random email. I sadly can’t give you anymore info as he would never speak of the war but did mention ( Taffy ) Zinzan. I would be ever so grateful if you could tell me more . Thank you very much. Judy.